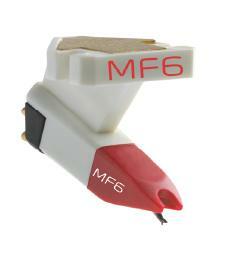 Ortofon MF6 Single Cartridge DJParts - All Variety of Parts that DJ Needs. Ortofon is proud to announce the arrival of the new MF-6 cartridges, value-priced ‘single’ DJ cartridges that can be used for a wide variety of applications. The Ortofon MF-6 provides a great balance of sound quality and tracking ability, for all types of DJs that require both accurate sound reproduction and good scratch & backcueing capability. The MF-6 sounds great for all types of music and has a spherical stylus which tracks lightly to help preserve your vinyl collection.